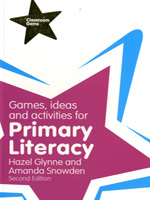 Games, Ideas & Activities for Primary Literacy, 2nd ed. A collection of 150 unique games and activities to help support teaching literacy in the primary classroom. Designed with busy teachers in mind, the Classroom Gems series draws together an extensive selection of practical, tried-and-tested, off-the-shelf ideas, games and activities guaranteed to transform any lesson or classroom in an instant. Easily navigable, allowing you to choose the right activity quickly and easily, these invaluable resources are guaranteed to save you time and are a must-have tool to plan, prepare and deliver first-rate lessons.